Capital Region history lovers gather in the Electric City for the 56th annual event. On a crisp and glorious Sept. 23, Capital Region history lovers gathered in Schenectady’s historic Stockade District for the 56th annual Stockade Walkabout. Nestled next to the Mohawk River in downtown Schenectady, the Stockade is New York state’s first historic district. The Walkabout, which is held biennially, opens private homes, churches and other areas of interest to the public to benefit the Schenectady County Historical Society and the Stockade Association. Boasting a three-century history and more than 40 pre-Revolutionary era homes, the Stockade has a lot to explore. The theme of this year’s tour was “Transformations,” as many sites have recently been re-purposed. The Old Courthouse, built in 1833, for example, is now a modern apartment building. Some of the buildings have been beautifully restored because of flood damage, and new owners and tenants were willing to welcome visitors inside for the day. There is debate as to which house is the oldest: the Dutch Colonial Robert Yates House on Union Street, which was built in 1727, or the Hendrick Brouwer House on North Church. 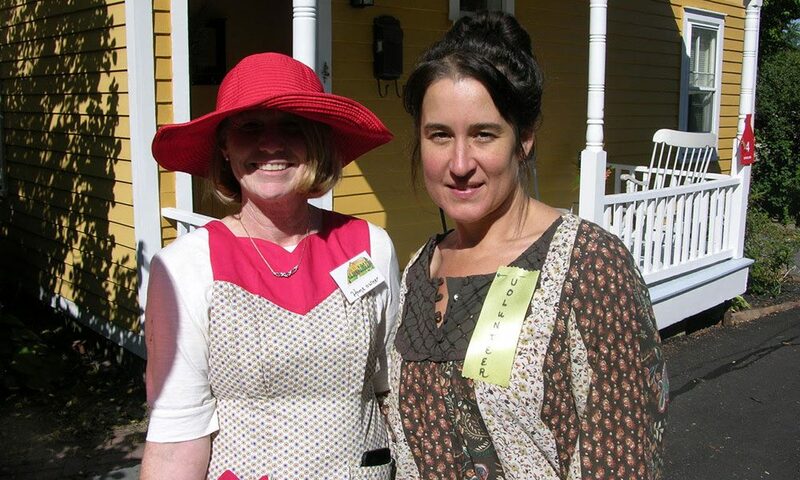 Carol DeLaMarter, president of the Stockade Association said, “It was a great day to invite people into the Stockade and showcase our history. The conversation about which house is really the oldest – Yates House or Brouwer House – was heard frequently. To quote Giles Yates van der Bogert in Walls Have Ears, ‘Aren’t we fortunate to have these two houses in our midst?’” The argument made in the 1966 book still has importance today. Aren’t we lucky to live amongst them? Some attendees wore period dress, Schenectady Community College archaeology students explained their findings from three test pits, and Joseph Doolittle, as he has for the last 25 years, spoke about the Schenectady Massacre and life in “Old Dorp,” the name Dutch settlers gave to the neighborhood. A blacksmithing demonstration and organ recitals in St. George’s Church, which dates to 1759, were also on the program. The Stockade has many charms that you don’t have to wait for next year’s Walkabout to discover. For more information on other tours and events, visit historicstockade.com.